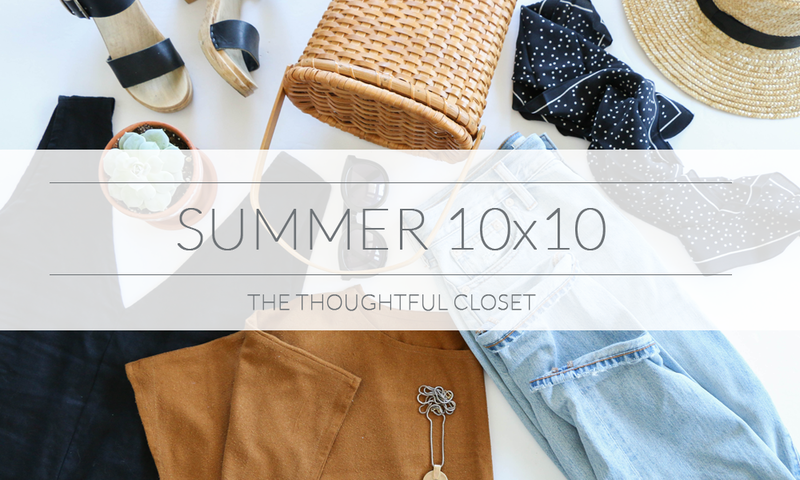 Today I’m so happy to kick off my Summer 10x10 Challenge! Once again I’m joining in on Lee from Style Bee & Caroline from Un-Fancy’s 10x10 challenge to get some inspiration and collaborate with fellow capsule/conscious living-ers! I’ve said it before but I really can’t say it enough. These challenges are so much fun! Not only does it get your creative juices flowing (10 pieces, 10 days, get creative) but you get to see all of the awesome outfits that thousands of women create with their own challenges! It’s pretty neat. So to official kick things off I’m going to share a brief note about what the challenge entails, the 10 pieces I chose & why. So let's dive in! 2. This is supposed to be fun so you can completely disregard all of the points above. Except for the limiting the number of items thing, that’s important :) you can do 12 or even 15 or 30! But give yourself a set number to play around with. I know several people who have ended up swapping out an item in their 10x10 due to weather or just because one piece wasn’t working out and they saw a great opportunity for another. That is totally ok! The whole point of this (in my point of view) is to learn more about your style, find new ways to wear your workhorse items and get creative! Now here are the items I decided on for my 10x10! I’ve had this blouse for a long time and even wore it in our engagement photos! When picking the items for my summer closet it felt like a natural choice. This is a new item for my closet this season and I'm so excited to test it out. I spent months (yes, months) trying to decide which j+j color I wanted. I finally settled on umber and so far I'm in love. Since it is going to be fairly warm I tried to focus on flowy tops that would be breathable as well as beautiful. This shirt is from the warm weather collection and I absolutely love the material. It's made from cotton poplin and is the most comfortable cotton shirt I've ever owned. It is as sturdy as a traditional cotton button shirt but feels airy and light. It's a great material for summer! I love this top. I purchased it last summer from the ES SS'16 collection. It's made out of weaved hemp and is no longer available. However, liz did bring the style back for the warm weather collection and it is available in linen and cotton. It's such a go to top for me in the summer that it had to be part of my mix! Jumpsuit! I tried one jumpsuit once from urban outfitters. It was on sale and not great and needless to say I never wore it. I had been on the hunt for a jumpsuit that I would truly love and was so happy to see this lovely in the ES WWC. So excited to experiment with styling it! I've had these flats for so long and find myself continuing to wear them over and over again. Fun fact, this is one of the only skirts I own! I brought it with me on our honeymoon to Greece and that trip really made me fall in love with it! I'm excited to play around with it even more in this challenge! I love these pants! They'd been on my wishlist for a while and I was happy to find them secondhand! They've already been on heavy rotation so they were a must have for this challenge. These lovelies are also heavily worn in my wardrobe. If I ever need a fancier shoe these are the first ones I grab. I fell in love with these jeans this past spring and had to carry them over into summer. I actually think these might turn into a year round item! I left shorts out of my 10 pieces since most of my outfits will be worn to work and shorts are a no no. The weather will be pretty warm (mid to upper 80s) so linen and light cotton pieces were my main focus. Fingers crossed for no rain!